Thumbnail photo of my children with the grave of their six-greats grandparents. The market town of Stainthorp (Staindrop), in “A Map of the BISHOPRICK of DURHAM North from London” by T. Badeslade and W.H. Toms, 1742. After a series of family and financial tragedies in the 1870s and ’80s, Charles and William Stainthorp both left the North Riding and moved their families to what would later become the metropolitan area of Tyne and Wear. William’s youngest child: my great-grandfather Henry Harland (Harry) Stainthorp, was born in Sunderland in 1904. He carried on the Stainthorp family butchering business on Tyneside, succeeded by his own eldest son: my grandfather, who ran a butcher’s shop in Whitley Bay until he retired in 1986. There were no (living) Stainthorps left in Hutton Rudby by the end of the nineteenth century. I’m grateful to the following people, some of whom do not even know me, but without whose help I would not have been able to write this post :– my late grandad Bill Stainthorp and my grandma Marjorie, Joan Stainthorp, Gill S., Carole A., John and Marianne S., Margaret Brabin, Alice Barrigan (North Yorkshire History), J. E. Stainthorp, the staff of the Lincolnshire public library service, the Borthwick Institute for Archives at the University of York, and several people on the RootsChat family history forum. Thank you. Page, William (editor). ‘Parishes: Rudby-in-Cleveland.’ In: A history of the county of York, North Riding. Volume 2. London: St. Catherine Press, 1923. British History Online. http://www.british-history.ac.uk/report.aspx?compid=64663 (accessed 14th October 2014). Hutton Rudby and District Local History Society. Handwritten transcriptions from the registers of the parish of Rudby-in-Cleveland. Entries for ‘Stainthorp’ and related spellings. Copy in the possession of Paul Harland Stainthorp (paul@paulstainthorp.com). Mawer, Allen. The place-names of Northumberland and Durham. Cambridge University Press, 1920. Internet Archive. https://archive.org/details/cu31924028042996 (accessed 14th October 2014). Simpson, David. ‘Place-name meanings P to S.’ England’s North East. 2009. http://englandsnortheast.co.uk/PlaceNameMeaningsPtoS.html (accessed 14th October 2014). Mills, Anthony David. A dictionary of British place-names. Oxford University Press, 2011. Google Books. http://books.google.co.uk/books?vid=ISBN9780199609086 (accessed 14th October 2014). Badeslade, Thomas and Toms, William H. ‘A map of the Bishoprick of Durham north from London.’ In: Chorographia Britanniæ: or, a new set of maps of all the counties in England and Wales, etc… 1742. Camden, William. Britaine, or, a chorographicall description of the most flourishing kingdomes, England, Scotland, and Ireland. London: George Bishop and John Norton, 1610. Transcription by Dana F. Sutton, 14th June 2004. A Vision of Britain Through Time. http://www.visionofbritain.org.uk/travellers/Camden/27#pn_9 (accessed 14th October 2014). Dufferwiel, Martin. Durham: over 1,000 years of history and legend. Edinburgh: Mainstream Publishing, 2011. Google Books. http://books.google.co.uk/books?vid=ISBN9781780573946 (accessed 14th October 2014). Sharpe, Reginald R. (editor). Calendar of letter-books preserved among the archives of the Corporation of the City of London at the Guildhall: letter-book F, 1337-1352. Folios cxxi-cxxx, pages 143-156. London: John Edward Francis, 1904. British History Online. http://www.british-history.ac.uk/report.aspx?compid=33540 (accessed 14th October 2014). 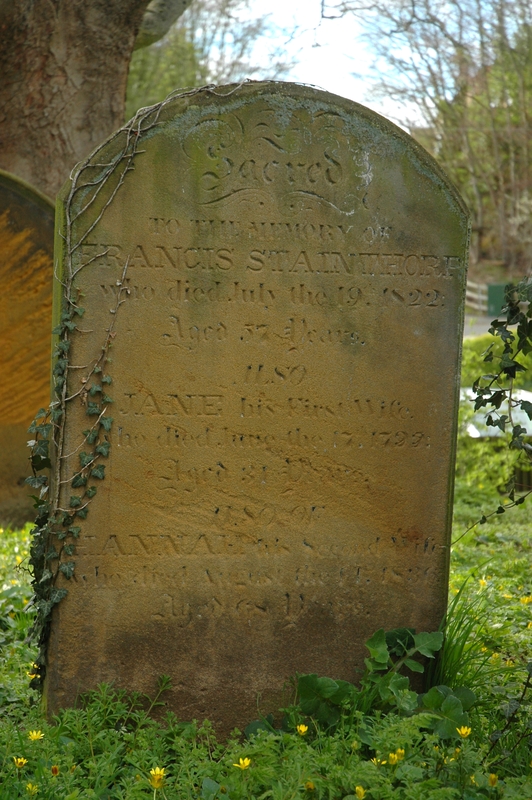 Headstone of Francis Stainthorp, All Saints, Rudby-in-Cleveland. Photograph taken by Paul Harland Stainthorp (paul@paulstainthorp.com), 6th April 2014. Find A Grave. http://findagrave.com/cgi-bin/fg.cgi?page=gr&GSln=Stainthorp&GSfn=Francis&GRid=128813340 (accessed 30th April 2014). Barrigan, Alice. ‘Linen weaving and the paper mill.’ In: Remarkable, but still true: the story of the Revd R.J. Barlow and Hutton Rudby in the time of cholera. Guisborough: Westgate, 2007. North Yorkshire History. http://northyorkshirehistory.blogspot.co.uk/2012/12/chapter-2-linen-weaving-paper-mill.html (accessed 14th October 2014). Pierson, Thomas. Roseberry Topping: a poem (originally published 1783): with notes, and also a notice of the author and a memoir of the late Thomas Jennett. Edited by John Walker Ord. Stockton: Jennett & Co., 1847. Google Books. http://books.google.co.uk/books?id=HbksAQAAMAAJ (accessed 14th October 2014). Fraser, Susanna. ‘What’s in a necronym?’ In Love and War. 9th June 2011. http://authorsusannafraser.blogspot.co.uk/2011/06/whats-in-necronym.html (accessed 14th October 2014). Diocese of York. Bishop’s transcripts. Parish of Rudby-in-Cleveland. Entry for the marriage of Francis Stainthorpe and Jane Kendale, 23rd May 1786. Diocese of York. Bishop’s transcripts. Parish of Rudby-in-Cleveland. Entry for the marriage of Francis Stainthorpe and Hannah Waring, 14th April 1798. Church of Jesus Christ of Latter-day Saints. Transcription from the registers of the parish of Rudby-in-Cleveland. Entry for the marriage of Francis Stainthorpe and Hannah Waring, 14th April 1798. Genealogical Society film number: 918436. FamilySearch. https://familysearch.org/pal:/MM9.1.1/NKBD-X5W (accessed 14th October 2014). General Register Office. 1841 census returns. Archive reference HO107, piece 1258, book 9, folio 13, page 18. Entry for North End, Township of Hutton, Rudby in Cleveland. County of York. The poll, for Knights of the Shire. York: T. Wilson and R. Spence, 1807. Internet Archive. https://archive.org/details/countyyorkpollf00unkngoog/ (accessed 14th October 2014). ‘Yorkshire election 1807.’ Wikipedia. http://en.wikipedia.org/wiki/Yorkshire_election_1807 (accessed 14th October 2014). Exchequer Court of York. The will of Francis Stainthorpe. Probate register 167, folio 621. Deanery of Cleveland, 11th November 1822. York: Borthwick Institute for Archives. Estate Duty Office. Death duty registers. Archive reference IR 26/932, S-T, folio numbers 1642-1942. Entry for Francis Stainthorpe, 11th November 1822. Kew: The National Archives. Barrigan, Alice. ‘People of Hutton Rudby in the C18/19: Southeran to Swallwell.’ North Yorkshire History. 10th June 2013. http://northyorkshirehistory.blogspot.co.uk/2013/06/people-of-hutton-rudby-in-c1819_10.html (accessed 15th October 2014). General Register Office. 1871 census returns. Archive reference RG10, piece 4861, folio 16, page 9. Entry for Goldie Hill, Hutton Rudby. General Register Office. Certified copy of an entry of death. Entry for Francis Stainthorp, 24th May 1840. Copy in the possession of Paul Harland Stainthorp (paul@paulstainthorp.com). GRO index reference: Stokesley XXIV 326. FreeBMD. http://www.freebmd.org.uk/cgi/information.pl?cite=hFGOb3hYcdX31Axmj%2FMOYA&scan=1 (accessed 15th October 2015). General Register Office. Certified copy of an entry of death. Entry for William Stainthorp, 14th February 1848. Copy in the possession of Paul Harland Stainthorp (paul@paulstainthorp.com). GRO index reference: Stokesley 24 399. FreeBMD. http://www.freebmd.org.uk/cgi/information.pl?cite=WTid0xIRy7p4MMXBgtkdJg&scan=1 (accessed 15th October 2015). Barrigan, Alice. ‘Epilogue.’ In: Remarkable, but still true: the story of the Revd R.J. Barlow and Hutton Rudby in the time of cholera. Guisborough: Westgate, 2007. North Yorkshire History. http://northyorkshirehistory.blogspot.co.uk/2013/01/chapter-24-epilogue.html (accessed 15th October 2014). Paul Harland Stainthorp (paul@paulstainthorp.com). Version 1.2.5, updated 19th November 2014.